The Sauropods (meaning “Lizard-Footed”) were an infraorder of large, four-legged, plant-eating dinosaurs, some of which grew to be the biggest of all the giant reptiles. Apatosaurus is perhaps the most famous species of sauropod dinosaur. 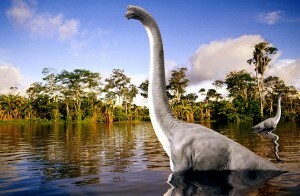 It may still be better known by the misguided name “Brontosaurus” which was popular through the 1970s. Apatosaurus and other giants such as Diplodocus and Brachiosaurus roamed the swamps of the western United States in a bygone era. Weighing up to 32 metric tons (35 U.S. tons), it is likely the creature described by Job (the oldest book in the Bible) to be the largest animal of all–“Behemoth.” Not only is there good historical evidence that these dinosaurs have co-existed with man, but stories from remote jungles suggest that some of these famous creatures still survive in remote areas!